How Hot Do Common Landscape Surfaces Get In Summer? Over the last couple of years we took the temperatures of many landscape surfaces on 40 degree days. You might find the results we got surprising. We discovered there was a great deal of variation in temperature between different surfaces. For example, from grass to gravel the temperature varied by 32 degrees. The findings from this important research could help contractors and designers create cooler landscapes. Some hard surfaces were a lot cooler than others. Selecting the right products can greatly reduce the surrounding temperature of your backyard entertaining area. With the spreading fear about the possible temperature rises, isn’t it time to consider using cooler landscape alternatives? It’s not surprising that the coolest temperature taken was from the surface water of a large pond, which was exactly 40 degrees, the same as the air temperature. The next coolest surface in full sun was the green grass on a sports field, which measured 45.65°. Dry grass on the same field was 51.5°. Green grass growing near gravel was found to be 52.15°, whilst dry grass next to gravel was surprisingly 62.2°. Dry grass further away from the gravel was cooler. Shaded turf near concrete was 47.2° whilst concrete in shade was 49.8°. Gravel in full sun was 77.78° and grey concrete on a tennis court reached an amazing 78.27°, with concrete surfaces around a house in full sun 74.75°. Fake grass did not fair much better reaching 66.95°. So the first trend that can be seen is that grass in full sun is much cooler than concrete and gravel, but so is shaded concrete. The shade of a tree reduced the temperature of the concrete by 25°. Lomandra Tanika growing in gravel that was 77.78 degrees just a few metres away cooled the gravel that was right next to it down to 53.9 degrees Celsius. To make sure your plants aren’t substituted and you’re getting the right Ozbreed plant, use this list of Ozbreed’s Authorised Suppliers. Substitution of plants can ruin your design. Plants that are of a totally different size, shape or texture are often substituted. Worse still, they are sometimes substituted with plants that will not perform in that situation, or even with a completely different species. With grasses and strappy leaf plants there may not be a very noticeable appearance difference, but there definitely is a performance difference. When Lomandra longifolia’s such as Tanika® Lomandra are substituted with Lomandra confertifolia’s there is a major performance difference as the confertifolia’s can’t handle tough roadside conditions. With some of our new Westringias it’s a bit of both. 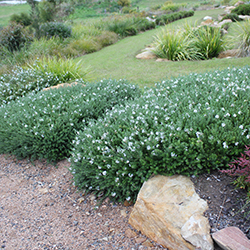 We have had comments on projects where Mundi™ Westringia has been specified and the plants had grown way above knee height. The problem was that Mundi™ Westringia had been substituted with common Westringia and the appearance is noticeably different. Usually contractors substitute to save a few percent on price, which helps their profit, or allows them to win the bid. Sometimes it is the supplier selling the wrong plant. How can you protect your design from this? How to make more green space, with less maintenance? Landscape contractors and architects, and home gardeners particularly those on acreage are presented with this question regularly. How to make more green space, with less maintenance? On one hand clients or gardeners want more plants and turf, and less concrete, providing a better, cleaner, cooler, and more pleasing environment, but on the other hand they want it maintained on a shoe string. Low cost maintenance starts with plant, turf, soil, and mulch selection, and can be enhanced by clever design, and caped off with efficient low cost maintenance. For 4 years at Ozbreed we have maintained 12,000 square metres of gardens and lawns with one plant maintenance staff every fortnight, and one lawn staff every fortnight. That equates to one man per week, with the odd clean up from extras once per year over a few days. The gardens are extensive. Usually our maintenance staff believe this would take three to four times as many man hours. So how can so many maintenance hours be saved? Normally I would not use my own experience to write an entire article, but in this case it is the simplest way to explain landscape maintenance on a pittance. Over the years many lessons have been learnt. It all starts with good plant and turf selections and intelligent design. Low maintenance low to no irrigation green life is essential. 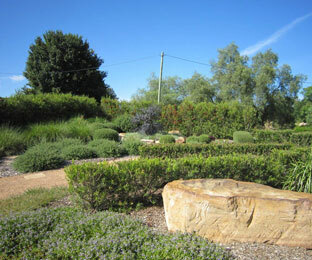 The main planting areas use low maintenance evergreen plants such Lomandra and Dianella types. 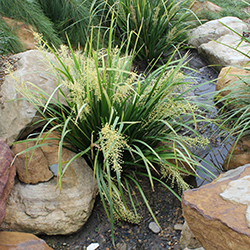 The Lomandra types are all longifolia and Hystrix types that are long lived and need trimming only every 4 to 6 years. We have avoided weaker Lomandra confertifolia types. The Dianella types are mainly caerulea types, which cope better with Sydney’s climate. In Victoria Dianella tasmanica and revoluta plants could also be used. So selecting on Genus alone is not enough for a low maintenance solution. Common forms also increase maintenance, as reliability, uniformity and tidiness is compromised. Revolutionary plants like Tanika®, and Little Jess™ are used in big group plantings. Design and placement is very important. These type of plants are planted close together to ensure no gaps after one year, ensuring weeds are chocked out. It is called planting for weed control. Cutting strappy leaf plants back every four years or so is very quick if you use a saw tooth blade on a brush cutter. This cuts rather than tears. Simply cut the tops of all of them at about 20 cm high, then rake out the old foliage and collect it. It makes a good straw for the vegie garden. Then shape each plant into a nice ball with shape hand shears. This method saves many hours.